Sexual Assault Awareness Month is an opportunity to start conversations about consent and its important role in intimate situations. With that goal in mind, several events throughout the month of April at the University of Indianapolis are designed to promote awareness of consent and how to talk about it. Anne Moelk, director of student support and Title IX coordinate, explained that heavy use of social media apps like Twitter, Facebook and Snapchat means less face-to-face communication. “So when it comes to sensitive topics like sexual contact, young people may not have the skills or experience in having those conversations,” Moelk said. UIndy’s program for Sexual Assault Awareness Month coordinates with the national theme of consent. From noon to 2 p.m. on Wednesday, April 10, in the Schwitzer Student Center, during the “Can I Give You a Kiss?” event, organizers will be handing out Hershey’s Kisses and stressing the importance of asking for and receiving consent for all forms of sexual contact. Learn more about how to ask for consent. 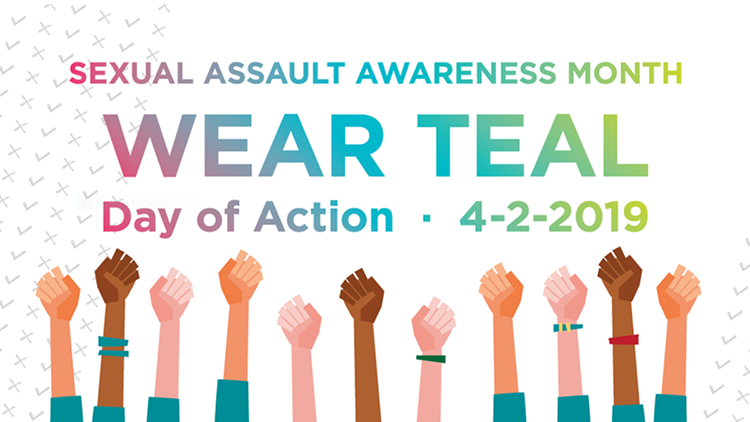 April 2: Wear teal for the “Day of Action” to show your support for victims of sexual violence and for those working to end violence in our homes, communities and nation. 9 p.m., Wednesday, April 3, Schwitzer 012: PRIDE hosts a Panel on Sexual Assault in the LGBTQ Community. 8 p.m., Thursday, April 4, UIndy Hall A: Jess Weiner presents “The Confidence Myth” as part of the Diversity Lecture Series. A workshop is planned from 3 to 4:30 p.m. in UIndy Hall B. More info here. 8 p.m., Saturday, April 13, UIndy Hall A: Mac Attack – stop by for mac & cheese and learn self-defense skills. Sponsored by CPB. Wednesday, April 24: Denim Day: Students, staff and faculty are requested to wear denim to promote awareness of sexual assault prevention. Throughout the month, various UIndy sports teams will be wearing teal shoelaces in their competitions to promote awareness of sexual assault prevention.